One-third of the world’s population, about 2.4 billion people, will remain without access to improved sanitation in 2015, according to a report recently published jointly by the World Health Organisation (WHO) and the United Nations International Children’s Education Fund (UNICEF). The report says that three south Asian countries, including Bangladesh, Pakistan and Nepal have shown significant improvement in the past 20 years. 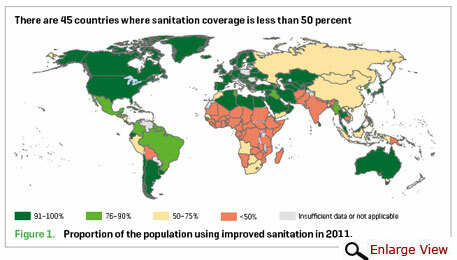 In India, however, more than the quarter of the population still practices open defecation. 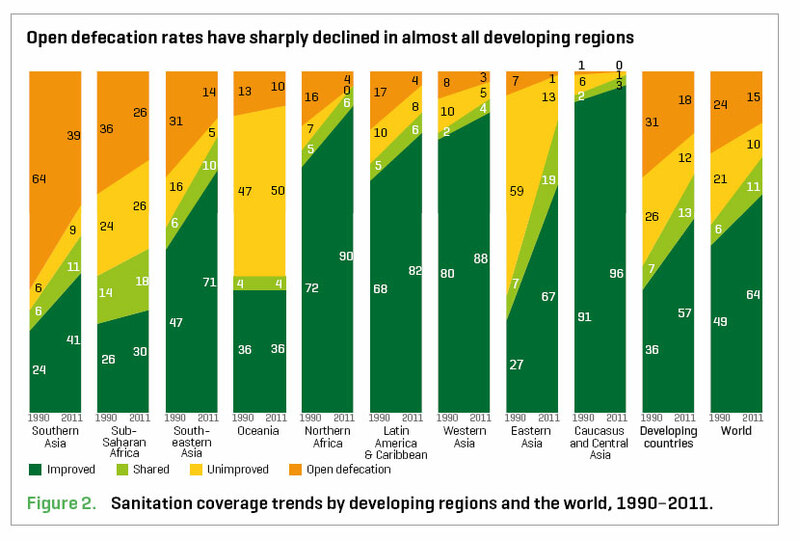 The report, titled Progress on sanitation and drinking-water 2013 update, warns that at the current rate of progress, the 2015 Millennium Development Goal (MDG) target of halving the proportion of people without sanitation compared to 1990 will be missed by 8 per cent – or half a billion people. The report, which is based on data collected in 2011 with updated information, was published on May 13. 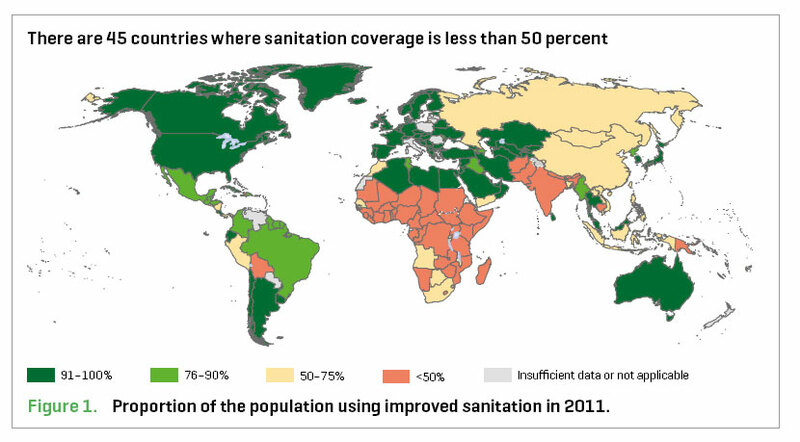 While three countries of South Asia – Pakistan, Bangladesh and Nepal – have been deemed good performers, India has less than 50 per cent of its people using improved sanitation (see figure 1). Bangladesh, with 32 per cent of total population practising open defecation in 1990, has shown an annual decline of 9.9 per cent to a figure of 4 per cent in 2011 (see table). Pakistan showed an annual decline rate of 3.9 per cent, lowering its open defecation figures from 52 per cent to 29 per cent. Nepal too has lowered its open defecation figures from 84 per cent of the population in 1990 to 43 per cent in 2011. This amounts to an annual decline rate of 3.2 per cent. “There is an urgent need to ensure all the necessary pieces are in place – political commitment, funding, leadership – so the world can accelerate progress and reach the Millennium Development Goal sanitation target,” says Maria Neira, WHO Director for Public Health and Environment. “The world can turn around and transform the lives of millions who still do not have access to basic sanitation. The rewards would be immense for health, ending poverty at its source, and well-being,” she adds. The report echoes the urgent call to action by United Nations deputy secretary-general Jan Eliasson for the world community to combine efforts and end open defecation by 2025. With less than three years to go to reach the MDG deadline, WHO and UNICEF have called for a final push to meet the sanitation target. Open defecation due to lack of access to sanitation poses a hazard to public health. Exposure to human excreta or its contamination of drinking water sources, causes a host of illnesses such as cholera, dysentery, typhoid, polio and infections with E coli and tapeworm. Such exposure can even cause epidemics.